UPDATE: Now that the free week is over, you can read the rest of this story by downloading an ebook from Amazon and Smashwords. Then you can read it on your laptop, desktop, Kindle, iPad, Nook, iPhone, or whatever device you use to read ebooks. This story was first published in the mixed-media, mixed-genre anthology “Exquisite Corpuscle” in November 2008. NOTE: F-bomb warning in the story below. You’ve been warned! Andy was DM again, and the stupid spaz couldn’t stop using the word to describe everything. Exquisite this, exquisite that. It was getting to the point where Mark wanted to blast him with a Magic Missile for a massive hit-point loss until he had no choice but to curl up behind his folded cardboard screen. Even the two Chrises, one on each side of Mark, were getting restless, waiting for Andy to finish his endless descriptions and get to the combat. But of course, Dungeon Masters were impervious—see, Mark wanted to say, I know fancy words too! —to any form of damage. They were untouchable, separate from both worlds, the real and the imagined. Three sets of eleven-year-old eyes scrunched up in concentration as they listened to the description. The air of the cramped dining room was filled with the plastic-cheese smell of cooling Tombstone pizzas, the last few triangles forgotten on the Formica counter. Kennedy pushed Play on the stereo next to the kitchen table. Tinny, familiar music began pouring from the speakers suspended from macramé hangers on either side of the dining room table. “Okay, so what else is on the map?” Mark said, trying to focus on the task at hand. Kennedy was losing interest, gazing over at the TV, probably thinking about the start of “The Incredible Hulk” at eight. Mark didn’t want the party to be over so soon, because could mean he’d end up back home. With Mom’s nagging and Dad’s drinking, it was like a war zone there, and he’d end up hiding out in his room again, alone. “Who died and made you leader?” The other Chris glared at Mark from above his character sheets and unpainted figures. His dark eyes were barely visible over the lank bangs of his bad comb-forward haircut. “Roll,” Andy growled from behind his DM screen as Men at Work embarked on a flute solo. This was the deepest into a game of D&D the four boys had ever gotten, and Mark could tell Andy had been afraid things were going to disintegrate like this at any moment. In their two months of weekly D&D get-togethers, they had yet to finish a single campaign. The siren song of the Atari 2600 and the fifteen channels of freshly installed cable TV were hard to ignore. “Who rolls?” Kennedy said. The song had ended, and he turned down the boxy stereo a notch or two. Kennedy’s parents were out bowling, and wouldn’t be in until midnight. As Kennedy’s blue die rattled three times across the fake wood of the table, Mark peeked at his own poor attempt at a map. He was on his fifth sheet of graph paper, the blue-on-white squares refusing to cooperate with Mark’s number two pencil and Andy’s garbled descriptions. They were in one of the many towers of Castle Deepmoat, or they were two levels deep into the castle dungeons, depending on which map Mark pulled from the pile. “Twelve,” Kennedy said, his chubby hands hovering over the die. To ensure there was no cheating, Andy demanded he be able to see every roll. Taped to his DM’s screen was the reminder: Touch the dice, pay the price. “Okay… So there were no traps.” Andy disappeared behind his screen, and Mark could hear the mad flipping of pages. Andy wrote all his campaigns himself, unable to lower himself to actually buy an already-written module like “The Keep on the Borderlands” at the Dubuque Waldenbooks. The two Chrises grabbed for their character sheets and dice, sending the last few half-painted pewter figurines in the middle of the table flying. Andy ignored the chaos and waited until all movement stopped, and even the Men at Work cassette cooperated, going silent at the end of Side One. Then, as if on cue, the night sky rumbled with distant thunder. Andy inhaled. “Anyone below 15 what?” Kennedy said, a hint of warning in his voice, as if to say: This is my house, don’t kill all of us here, especially not my characters. Andy was staring at Mark from over his DM screen, surprise in his eyes along with a hint of victory. Mark’s hands felt heavy as he picked up his pencil and tried to think of something to write on Greybeard’s character sheet. He felt like he’d just been screamed at by his mother after being read the drunken riot act by his dad. And, to make matters worse, according to Andy had said, there was no saving throw for being turned to stone. The sting of the sudden turn of events was lessened partially by the concern of his two buddies, but Mark still wasn’t able to talk. “All right, let’s rumble,” Kennedy said, already rolling as Mark tried to pick up his orange six-sided die. His fingers didn’t seem to want to cooperate. He’d taken to thinking more and more about Greybeard’s history, fleshing it out during his long summer days in his small Iowa hometown, riding his bike around town or skipping Little League practice, avoiding going home to be with his parents. He enjoyed pretending to be Sir Elliot, his paladin character, but most of the time he felt like he was Greybeard, wizard from the Darkening Swamps. And now, he thought as rain began to spatter against the sliding glass door leading out to Kennedy’s back deck, Greybeard had been turned to stone. And there was no saving throw. Mark finally gathered up all of his multi-colored dice in one chubby hand and waited his turn. Hopefully Mark would let him roll a new character that could join the party, somehow. Mark vowed not to make the mistake of getting so close again, in a game or anywhere else. Not if it stung like this. The rain outside was falling like machine-gun fire by the time it was Mark’s turn to roll for Sir Elliot’s turn in combat. His friends turned to look at him. 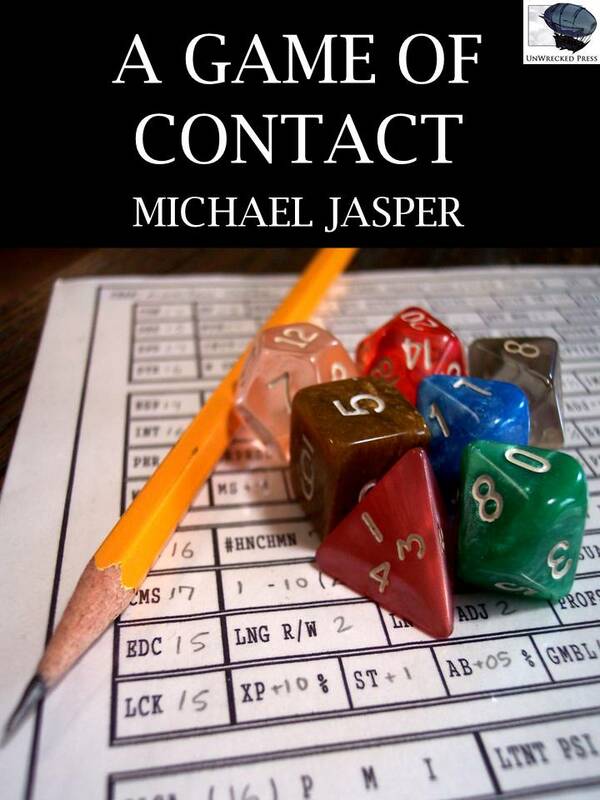 Mark shook all seven of his multi-sided dice in both hands, and then he flung them onto the table as hard as he could, knocking over Andy’s DM screen, crashing into the miniature figures still left standing, and scattering pages and dice across the room. To read the rest of the story, download the ebook from Amazon or Smashwords.